Bobby Jindal: I am running for president. Seriously! You have to believe me! Bobby Jindal has carefully planned to carve out a niche as the candidate of choice for Republicans who want a bombastic xenophobe in the White House but find Ted Cruz too intellectual. 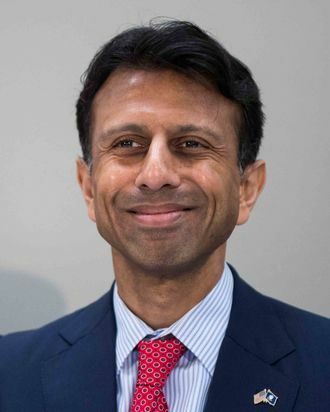 Jindal’s antics included a video of himself taking part in a push-up contest. But Donald Trump has waltzed in and stolen his act, relegating Jindal to obscurity. Today the Louisiana governor gave a speech unleashing a stream of insults against the Donald, many of them completely on point (i.e., "We know that only a weak and small person needs to constantly tell us how strong they are.”). Or at least it would be on point from somebody else, somebody who had not distributed a video of himself performing feats of strength. Coming from Jindal, it sounds more like a complaint of copyright infringement.